We’ve already shown you what you’re looking for with your pre-game eating. This post is going to show you some practical ideas of how you can get the nutrition you need to perform at your best, quickly, conveniently and affordably. You’re in the right place to find your perfect pre-match meal. You may have already read our advice on how to create your perfect pre-game meal. It’s packed with advice on fuelling up before a game or practice – including 4 common mistakes that you might be making with your pre-game eating. If not, don’t worry, here’s the recap. 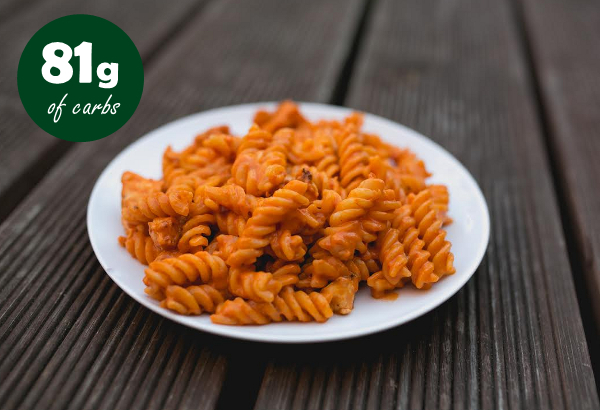 To focus on eating carbohydrates, preferably good quality starchy carbohydrates that will convert into glycogen which will provide the power to your muscles. Depending on the intensity of exercise you’ll be doing, your pre-game meal should contain between 1g and 4g of carbs for every kg of your body weight. At first, we suggest you consume 1g of carbs per kg of body weight. This should be adequate for a game of 5-a-side lasting less than 1 hour. Gradually increase this amount if you find that 1g per kg of body weight isn’t enough. Eat your meal at least 2 hours (but not more than 4 hours) before exercise is about to start to ensure it is digested properly. When it comes to pre-match meals, if you eat at least 1g of good quality starchy carbohydrates per kg of body weight at least 2 hours before kick-off, you can’t go too far wrong. Start there, and if that’s not enough, increase your allowance next time. So if you’re trying to take on 1g of carbs per kg of your body-weight, then for the average man (about 70kg) that’s a meal containing around 70g of carbs. But what does that look like on a plate and what sorts of meals can you prepare to get it? It’s these questions that the the 11 ideas below are designed to help you with. 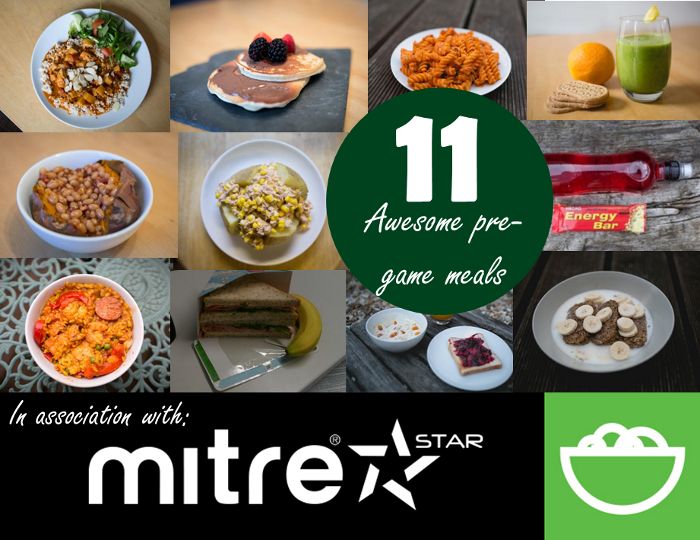 These are tried and tested ideas that will help you see how quick, easy, tasty and economical it can be to get the recommended pre-match meal requirements. These are just starting ideas for you. With a bit of inspiration, hopefully you will be able to come up with some of your own ideas. Experiment with the type of food you eat, the quantity of carbs you take on and the time before a game that you eat it until you find the combination that works for you – just don’t do it before a big game, in case it backfires. 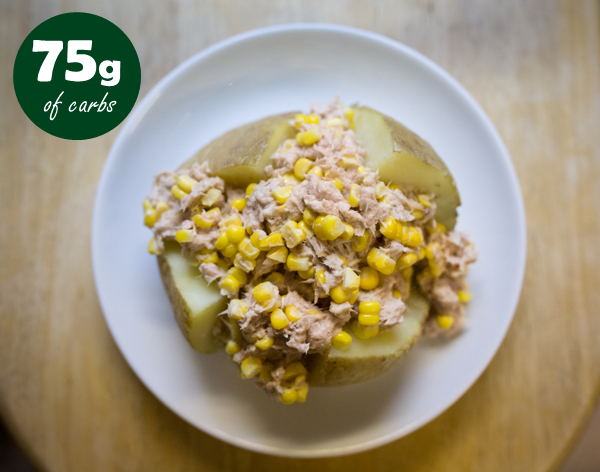 The jacket potato is a classic source of starchy carbohydrates, so almost anything you can top it with should be ok. The tuna gives it flavor and, whilst it does little to add carbs, it adds protein – a necessary part of a balanced diet. The sweetcorn, on the other hand does add a few starchy carbs as well as vitamins and minerals, making this a good meal. Extra tip: If you can bring yourself to do it, eat the skin too as there are extra nutrients there. 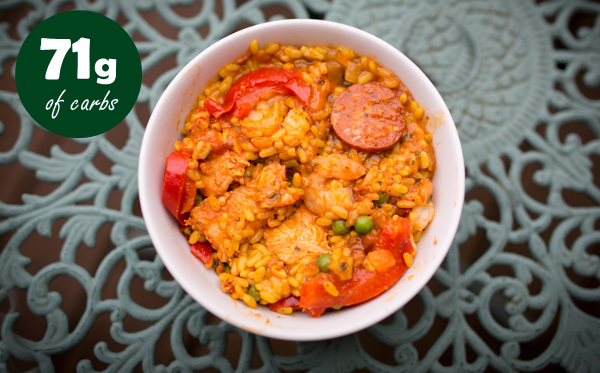 Paella is a superb, carb based meal. To cook it well takes time and effort (as well as the right type of rice), which you might not have. Thankfully you can cheat by buying some very good pre-made ones from the supermarket which you can microwave in minutes. Perfect if you’ve in a rush. The one above is a 400g chicken and chorizo paella, purchased from a major supermarket for less than £4. Who knows, maybe it will help you play like the Spanish on the Futsal court? You just knew that a pasta dish would have to appear somewhere on this list didn’t you? Ok, let’s get it out the way now then. Yes, pasta is the classic football player’s meal. That’s probably because it provides a very good hit of carbs, plus adding a sauce will make it a bit more interesting. In this case we’ve gone for a tomato and mascarpone sauce (quite creamy tasting) with some char-grilled (our way of saying we overcooked it) chicken in there but you can probably come up with some better creations. In terms of quantity, to make this we boiled around 300g of dried pasta, added a 500g jar of sauce and some chicken that we had grilled and then diced. The serving pictured above is about a third of the total batch. Finish it off with a side salad. 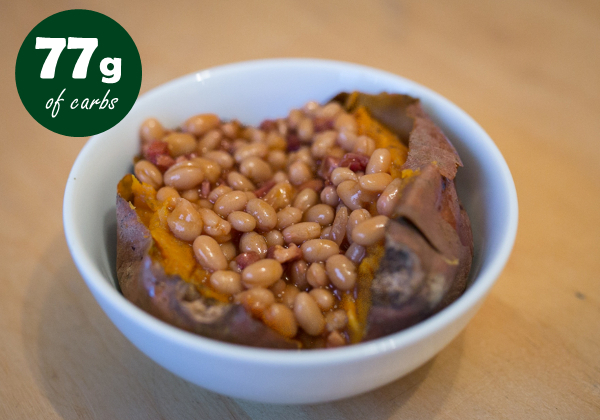 We already had the traditional jacket potato above, but how about going for something a little more adventurous in the form of a sweet potato. Besides the fact that it contains a good dose more vitamin A and C than a regular potato, it’s something different. Here we’ve covered it in a variation of ‘Boston beans’ – that’s baked beans with bacon in (available in cans from your local store). Yum. Tip: you can microwave a sweet potato – no need to have it baking in the oven for ages. A big favorite of ours, and it’s simple too. Take some lean chicken breast, cook it up in a pan (using very little oil) with a diced potato (always on the hunt for extra carbs!). Then, get your favorite brand of pre-made curry sauce and stir in the chicken and potato to it – you can also at this stage add chopped tomatoes (from a can is fine) for a little something extra. Now, here’s our tip – cous-cous with a curry is a revelation. The traditional serving of rice is fine, but cous-cous has a soft texture that beautifully soaks up the sauce. Best of all, making it is as easy as just pouring some boiling water on it and leaving for a couple of minutes. 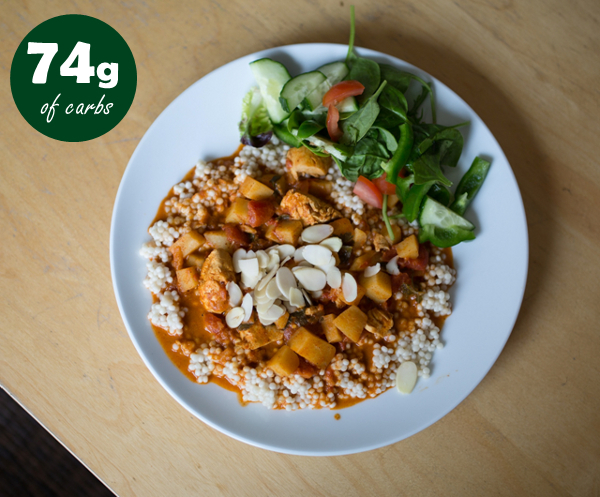 You can either use normal size cous-cous or the giant type pictured. This one is so very simple. 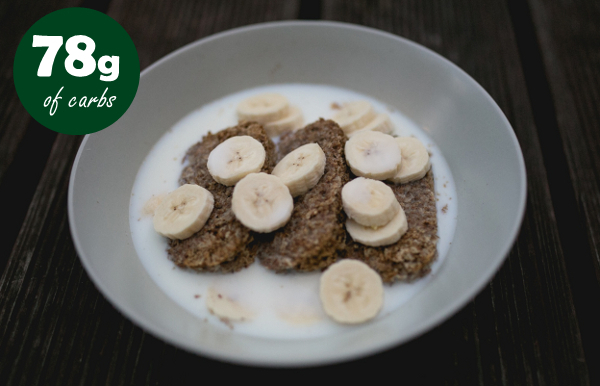 For just three Weetabix bars, a banana and some milk, you’ve got a nice big hit of carbs! It takes only a minute to prepare (you’re not in danger of burning anything as there is no cooking involved) and the whole bowl will cost you less than 50 pence. It’s one that I eat from time to time, especially if it’s a morning game. Personally, I prefer to put a sprinkle of sugar on there as well, just to annoy my dentist. Don’t forget: although it’s traditionally a breakfast cereal, you can eat it any time. A real favorite here – not just with adults, but with kids as well. These will take you a few minutes to make but are really simple. 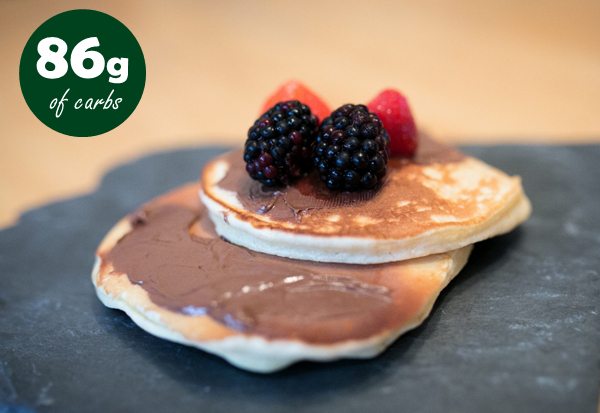 As they are flour-based there’s a lot of carbs, plus there’s a large hit of sugar too (almost too much sugar) meaning that you will need only the thinnest of coatings of chocolate spread (Nutella) to serve. Why not add some berries on top, as a token nod to a balanced diet. If you’re interested, we’ll post a video of how to do them like this – let us know in the comments below. And yes, we did make the ones pictured – we made everything in this post! Apparently it’s all about blending up your own smoothie concoctions these days. 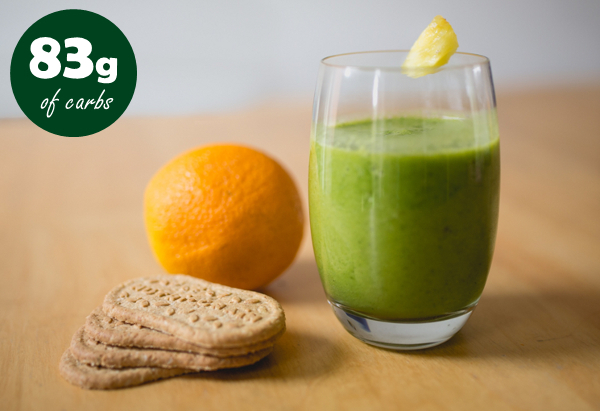 By mixing a combination of fruits you can make yourself a tasty, super-charged glass of vitamins and minerals – the one above even has spinach in – and tasted very nice too. Tip: in order to get enough carbs, you’ll want to make sure that you include a banana in your smoothie. 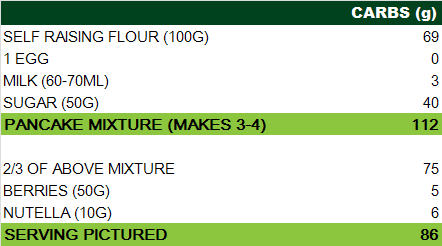 If you want to increase the carbs further, you can add oats to the mixture. 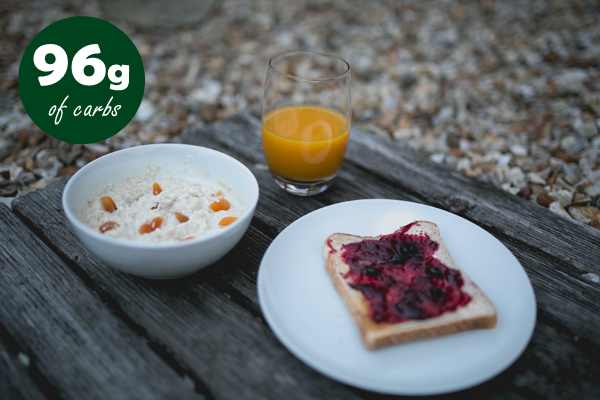 The breakfast bars top up the carb content, but you could instead have toast (as shown in the next suggestion). A good one for a cold winter morning where you have an early kick-off. This small amount of porridge should keep you full for a while, as well as giving you some much needed warmth. Add some dried apricots to improve the flavour as well as giving extra nutrients. The carb content of all of the above is quite high – to get it back to around 70g leave out the fruit juice and replace with water. Quick tip: cut the apricot straight into the bowl using scissors, it’s a lot less fiddly than a knife. This combination is your friend where you’ve got a game starting after work. Chances are that you won’t have food preparation facilities at your place of work or study, so you will need to buy something quick and easy instead. If you need to add more carbs then go for the combination on the right – it’s that easy. You might also try a sandwich and a sports drink combo – this will help get fluids on board too. To give you an example of where this meal might work. I work in an office and sometimes have a game of 5-a-side after work at 7.30pm. I don’t get chance to go home to get a proper meal first, so mid-afternoon I’ll head down to the shop to pick up the above combination. I’ll eat it at 5pm, two and a half hours before I’m due to play. Although the meal isn’t complicated, or expensive, it gives me all the energy I need to make sure that I’m firing on all cylinders by game-time. Clearly this is NOT a great meal but it does make an interesting point. 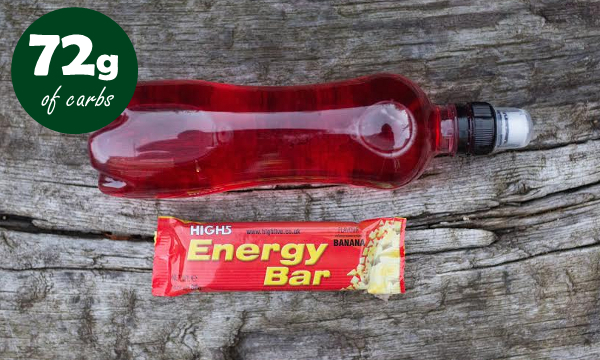 This energy bar and sports drink (take your pick of the many brands out there) will take you a couple of seconds to buy and then you can keep them in your sports bag for weeks in case you ever get caught short before the game. Although this would be very much a reserve choice behind the option of getting proper food, it would still give the carbs needed. Tell us in the comments below: what’s the pre-match meal that works for you. If it’s good, we’ll feature it on the site! It’s not just the pre-match meal that you need to focus on. Don’t forget that a lot of those carbs are going to be burned off during exercise so to replenish your stores and ensure that your body recovers, you will need to take post-game nutrition seriously. You can read all about it in our Foolproof Strategy for Post-Game Refuelling. Alternatively, if you need to go back to basics, here’s what you should be eating everyday to support your football performance. Hey, I just wanna say thanks for all this info regarding football nutrition as it is very important to get the basics right. I hope you keep posting on this website. Thanks Andrei, glad you’re finding it useful. I probably would not eat number 6 on the day of the game “Weetabix with banana” Contrary to what you have put, it’s high in fibre and fibre is slow to digest not quick. The porridge would be good though. Hi Marc, you’re absolutely right. High-fiber foods digest slower in your body. Low-glycemic foods are typically high in fiber. I personally still wouldn’t shy away from meal 6 if you fancied it (and it certainly helps get things moving for me), but I would definitely experiment with when I ate it. If 2 hours before kick off was too late, I might try moving it earlier until I got it right. Just stresses the point of using a bit of trial and error when it comes to nutrition. We’re all different. Other examples of high-fiber foods include oats, whole grains, fruits, vegetables and legumes. Again, if somebody was struggling with this, then there are plenty more ideas to try out. Definitely worth experimenting.